The Strucker family has played a central role in Fox's The Gifted, and X-Men fans have watched them with an eager sense of anticipation. The Strucker family has played a central role in Fox's The Gifted, and X-Men fans have watched them with an eager sense of anticipation. The show has paid homage to decades of dearly loved comics, and it's clear that showrunner Matt Nix is an X-Men fan. Given that context, it was always evident the surname "Strucker" had been chosen with care. Now, at last, we finally have confirmation of the comic book connection. 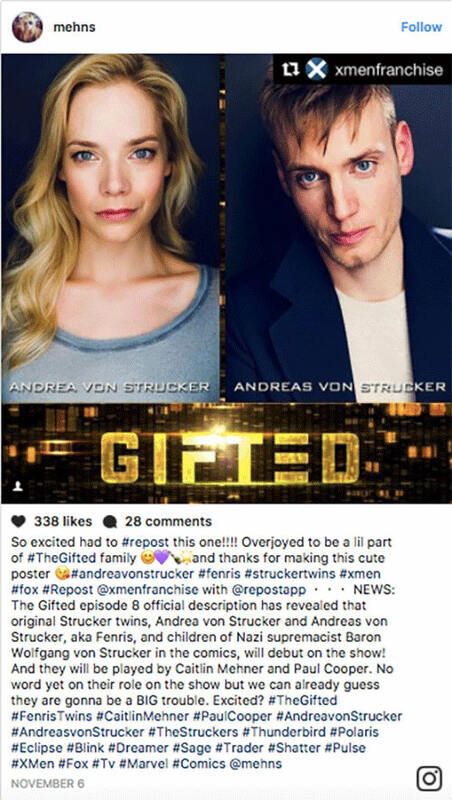 Caitlin Mehner and Paul Cooper have been cast the original Von Strucker twins, Andrea and Andreas Von Strucker. In the comics, Andrea and Andreas are the children of Baron von Strucker, a major figure in Hydra, who refer to themselves as the Fenris twins. The characters were created by Chris Claremont and John Romita, Jr., back in the 1980s, and introduced as powerful super-villains in their own right. The Fenris twins are classic #XMen villains, and their power is intriguing and unique — when the siblings hold hands, they're able to fly and generate powerful bioelectrical blasts. There's always been a pretty sinister subtext to Fenris, with ominous hints of an incestuous relationship between the two (Christina Strain's recent Generation X #7 dropped a lot of not-so-subtle teases). "Multiple international intelligence agencies are on the hunt for the perpetrators of Monday’s devastating terror attack in Rio de Janeiro. The suspects are of European descent and suspected blonde-haired, blue-eyed twins with dangerous and highly destructive mutant abilities." But what part will the Von Struckers play? Will they appear in a flashback, as the series explores the Strucker family history? Perhaps the most intriguing possibility is that, in The Gifted, the Fenris twins don't age. If that's the case, they could still be active, and no doubt would be fascinated with Lauren and Andy. Whatever the truth may be, so far The Gifted has proved to be a tremendous comic-book-accurate adaptation, so Fenris are sure to be an exciting addition.